1) What is your writing inspiration? When I was at school they made us read books that I really didn’t “get”. I never understood Shakespeare or why the so-called classics were so revered. The one exception was Orwell’s 1984 – that really stood out for me and I must have read it at least ten times since then. However, when I left school I didn’t care much for books at all – I was probably scarred by what I deemed to be mostly awful literature they inflicted on me! It wasn’t until my early 20s that I started reading and enjoying books, and then it was all about horror. Stephen King and Richard Laymon were big favourites at the time – still are – but now I read all sorts of fiction from comedy to crime. I use my local library regularly and sometimes I will judge a book by its cover and take something just because it looks interesting. You’d be surprised how many great authors you can discover this way. All writers will tell you that reading other people’s work is part of your job and I suppose that’s true. Most people think there’s an element of darkness to my stories and that definitely comes from the amount of twisted stuff I’ve read, at least I think that’s why! A lot of my stories come from snippets of conversations I’ve overheard in shops or on buses. I’m always on the lookout for new ideas and a trip into town could well yield half a dozen new stories or at least the seeds for them. 2) Why did you choose flash fiction? I wasn’t even aware of the term ‘flash fiction’ when I started writing it. I’d been attempting to write short stories for a few years, but I was struggling to complete any of them. Some friends at a book group I used to go to suggested we had a short story competition of sorts and after much debate over what the word-count should be, somebody suggested 100 words. I wrote one that very evening and then wrote a couple more. That’s when I got the idea for my first book, 100 x 100. I never thought I would manage to write 100 stories of any length and it was quite an achievement for me to accomplish, being that I was the writer without a full story to his name before that. At some point while I was writing the 100-word stories I became aware of the term flash fiction and realised there were a lot of people writing it and even more reading it. I’m not going to say it was like finding my own people at last or anything poignant like that, but it felt good to finally be able to write something that was considered a completed story. I guess in this day and age when everyone is too busy and needs their entertainment in bite-sized snippets, flash fiction makes perfect sense. 3) When writing flash fiction what do you enjoy the most and what challenges you the most? I like the fact that the normal rules of storytelling go right out the window with flash fiction. I’ve never been a fan of playing by the rules anyway and so it suits me just fine. A story can start and end at whatever point you want it to and there can be a message or point or it can just be seen as what it is – a brief snapshot of a conversation or event. As for challenges, making myself write stories of an exact length is always good. I generally just write the story and then tweak it until it’s 100 words or whatever parameters I’ve set. It has happened before that I needed to shed almost 100 words to make it fit and that might lead to the story being abandoned or saved for something else. I once wrote a story with all dialogue where every line was a question. It was very hard to do, but it felt great when I managed to finish it! In November I did my little twist on NaNoWriMo and had a story in 30 parts, one new one each day, and that was a very tough thing to do for me. It was dangerously close to writing “properly”, having to continue with the same theme and story for so many days and I’m not sure I’d do it again. Maybe I’ve got a short attention span or something, I don’t know, but writing flash fiction seems to be the ideal way for me to express myself. 4) You write a flash fiction story every day. Are you always inspired or do you force yourself to write something no matter what? I actually took all of December off from flash fiction writing, but I intend to resume the daily dose from the start of January. With the exception of a few other days I’ve been doing a story a day for around a year and a half. I guess this is where the magic gets shattered, because the stories aren’t necessarily all written on the day they’re published. Sometimes I’ll write several over a weekend and publish them as and when. I think the most stories I’ve ever had sitting in my drafts at any one time is 20. Time is the major factor behind when I can write. Real life gets in the way sometimes and while it doesn’t necessarily take that long to write a piece of flash fiction some days it is tough to find time for writing at all. I’m sure any writer will tell you they try and write every day and if I don’t write I’ll at least think about ideas for stories. The good thing with flash fiction is you can think about ideas while you do something else and sometimes have a fully formed story in your mind before you actually start writing it down. Some days I get several story ideas and others none. That’s when I hope I’ve got something tucked away in my drafts folder! 5) Any advice for aspiring flash fiction authors? Just write. It’s that simple. If you enjoy writing in any way then you should try it. The whole “everyone has a novel in them” thing might be true or it might not be, but I’m sure everyone definitely has some flash fiction in them. It can just be like telling a joke or anecdote and there are plenty of great verbal storytellers who have perhaps never written a word before. As for achieving success with flash fiction, I’m not sure that’s possible, although it depends on your idea of success. Some days 100 people might read my Flash Fiction Daily story and that feels pretty good, but I doubt any major publishers are too interested in microfiction. Of course I’d be happy for them to prove me wrong! Tim Jones writes and writes and writes and writes. 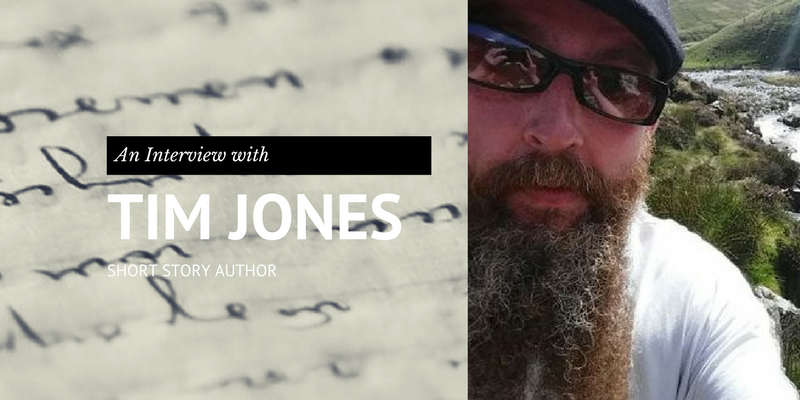 He has written hundreds of flash fiction stories, scores of short stories and has recently finished his first full-length novel. His computer is crammed full of Word documents containing unfinished stories he hopes to complete one day. Despite the dark themes present in a lot of his stories, Tim is actually very well-balanced and is not a maniac at all. Great interview, Tim! It’s wonderful to know more about you. I hope we talk often in 2018. As my friend Hammond likes to say, “You’re a card, and you need to be dealt with.” Haha. I liked your interview, Tim; I especially liked your honesty. By the way, I ordered your book of 101 stories of 101 words because I like your style. I hope you do continue.